So, it’s the first Sunday of the month and i’m due a shampoo and protein treatment of some sort. The first wash of the month is when i spend the most time on my hair. The night before i did an oil treatment using my oil mix, sectioning my hair into four and applying oil and then twisting the sections. I put a plastic bag over my head and then wrapped my headscarf round my head and went to bed. I shampooed my hair using Aubrey Organics J.A.Y Revitalising Shampoo for dry/damaged hair concentrating on my scalp mostly, rinsed and then final rinsed with ACV diluted in water. About 1/4 cup ACV to 500ml of water. I didn’t wash out the ACV but left it on my hair as i went to prepare the bentonite clay. 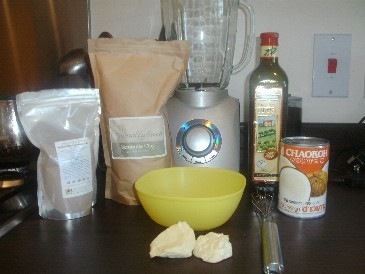 Things needed are: Bentonite clay, Rhassoul clay, Coconut milk, water, Olive oil, Cocoa butter, blender/hand blender, pot. First, i added about 200ml of coconut milk to the pan and about the same of water and warmed it gently on the stove. Whilst it was warming i added in a chunk of cocoa butter and let the heat of the milk melt it. Then i added in some olive oil. 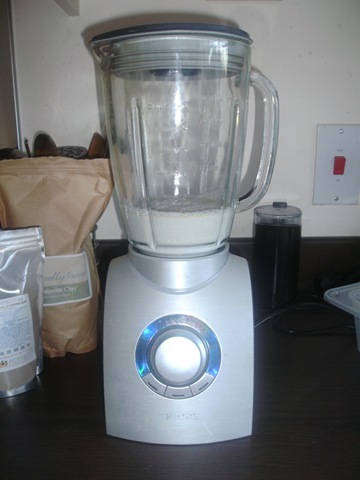 I put the milk mix into the blender and turned it on low. I added 1 tablespoon of Rhassoul clay and then slowly added in 2-3 tablespoons of bentonite clay until the mix was just a bit thicker than the thickest yoghurt. This is what it looked like. I immediately rinsed out my blender as i did not want the clay to tarnish the metal blades. With the clay mixed i went back upstairs to continue with my wash routine. I applied Herbal Essences Hello Hydration and detangled using the Denman brush by taking one section at a time untwisting, brushing, rinsing and retwisting. I towel dried my hair and one section at a time took down the twist and applied the clay mix to my hair. I tried to make sure i really covered my scalp with the mix as well. 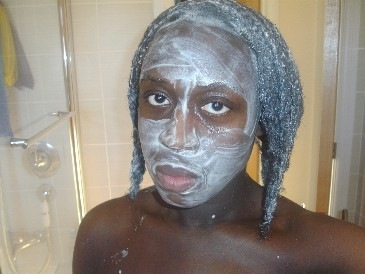 I also applied it to my face as i know bentonite clay is really good for the skin. If you suffer from acne then i would do this with caution as there are oils in the mix. 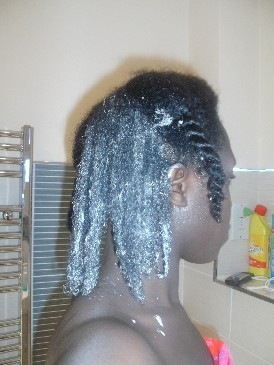 I left it on for about 15 mins and then rinsed it out, making sure i retwisted the section once fully rinsed. I deep conditioned with JASON’S 84% Aloe Vera conditioner mixed with honey, macadamia oil and avocado oil. I left it on for about 2 hours with a plastic bag over my head. I rinsed out the DC without taking down the twists, towel dried, applied my leave-in conditioner, shea pomade and hair oil, oiled my scalp with the pomade and braided my hair into four large braids to dry. Notes – I really don’t like the way my hair feels after i shampoo it. It feels so striped. It’s dry and squeaky and horrible. I notice this as soon as i rinse out the shampoo. I tried to make sure i just shampooed my scalp but inevitably it got into my hair and striped it. I’m really starting to reconsider shampoo in my regular regime as i don’t think my hair likes it very much. What i’ll do is i’ll try using a different shampoo next time and see if that is the cause. If there’s no difference in feel then i think i’ll shampoo only occasionally and use the herbs, ACV and the clays to cleanse my hair. Also, next time i’ll definitely leave the clay mix in my hair for bit longer, maybe 30 to 45 mins and see if i can get an even better result. When i was rinsing out the clay my hair felt so good, nourished and conditioned but on the inside. I can’t quite explain it but i know my hair liked it lots. The coconut milk really strengthened my hair whilst the oils conditioned and the clay’s removed any impurities and also added essential minerals into my strands. I’ll probably follow this post with the benefits of each clay and coconut milk. ← Let There Be Moisture! Have you ever heard of terressentials? I’m asking because your clay mix sounds good enough to work the way terressentials does – it’s a clay shampoo! I actually feel the same way you do about shampoos so I’ve started using my homemade version of terressentials and my hair loves it! The scalp is clean and hair doesn’t feel stripped. You just have to take you treatment one step further and massage your treatment into the scalp to clean it and as well as working it through the hair, before you leave it to sit a bit. Since you treatment has proteins and oils in it, it acts as a shampoo and conditioner all in one. Hope that helps! Hi Sam, yes i have heard of terressentials. I’ve seen tutorials on YouTube and have also visited their site to read their ingredients. It’s a very simple product and i’m confident that this clay mix will do EXACTLY what their clay shampoo does as it’s pretty much just aloe vera juice and clay with some essential oils added. Thanks also for all your tips. just wanted to know if you are still using clay and how is working for you?